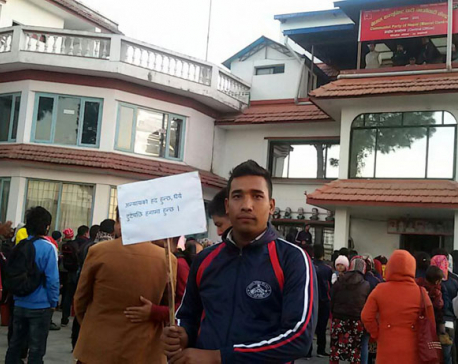 KATHMANDU, Nov 9: Nepal Police on Tuesday morning arrested former Maoist combatants who had been picketing the CPN (Maoist Center) party head office, Parisdanda since Monday demanding 'justice' for their contributions during the People's War. About 169 former Maoist child soldiers, who were discharged from the Maoist cantonments after finding them 'ineligible' for integration into the national army, had been protesting outside the party office causing obstruction to the day-to-day operation of the office. SSP Bikram Singh Thapa, chief of Metropolitan Police Range, Kathmandu, said, “It is unlawful to occupy others' properties and disrupt the operation of the office. So we detained all of them.” But we released all of them on condition that such activities would not be repeated again, he added. The agitating former Maoist combatants were kept at the Metropolitan Police Circle, Singha Durbar, Metropolitan Police Circle, Maharajgunj and Metropolitan Police Circle, Tinkune after their arrest. Over 500 police personnel were deployed to make the arrests. Earlier on Monday, over 300 discharged Maoist combatants had entered the Maoist party office demanding that the party, which is also heading the government, should back their demands. They had claimed that they were not 'treated fairly' by the party and the state despite their noteworthy contributions in the past. In their seven-point demand, the discharged former Maoist combatants have also sought equal status as that of the voluntarily-retired Maoist combatants from the party. Stating that their child rights were violated by both the Maoists and the state, they have also demanded justice as per the international laws. Similarly, the discharged combatants have also asked for social and financial packages from the government for their livelihood and education. After their release from the police custody, the former combatants said that their protest would continue until their demands are fulfilled.